Although most blockchain technology companies are promising disruption across multiple industries, Vitalik Buterin, the widely accredited crypto-genius and creator of Ethereum, believes that for blockchain to reach mass adoption, it must first solve the “scalability trilemma” – the three essential factors which the perfect blockchain must provide. Perhaps the single most pressing issue persisting between blockchain and widespread use is the lack of blockchains which offer scalability, security and adequate decentralization in equal measure. At present, most blockchains can only offer meaningful solutions to two of these three essential requirements. But now, it seems one blockchain company is coming close to solving the trilemma issue. Blokt caught up with the Tomo team, to shed light on their scalable blockchain solution, which offers instantaneous transactions and leading security features. TomoChain is a blockchain protocol project headquartered in Singapore, which has recently celebrated the launch of its mainnet in December 2018. With additional offices in Vietnam and Japan, TomoChain is strongly positioned to capitalize on the South-East Asian blockchain market. TomoChain was founded by Long Vuong, co-founder of the successful NEM blockchain, alongside three other co-founders with strong academic and financial backgrounds. Since the launch of its mainnet, TomoChain has received a high level of interest from the blockchain community, due in part to its impressive masternode passive staking rewards, near zero fees, and its answer to scalability problems. 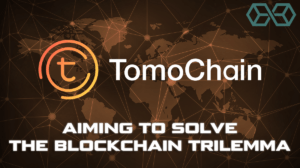 How Does Tomochain Address the Scalability Trilemma Problem? One of the main attractions of the TomoChain blockchain is its reported solution to the scalability problems faced by other chains such as Ethereum. This allows for both secure and fast transactions with low fees, while still maintaining decentralization. TomoChain achieves this via a unique distribution of 150 masternodes, which TomoChain call Proof-of-Stake Voting (POSV). TomoChain achieves an average block time of just 2 seconds, making transactions virtually instant. The Tomo team added that in the future when the TomoChain network is operating at full capacity, TomoChain developers will implement unique sharding solutions to scale the TomoChain blockchain further. It’s hoped that following the successful implementation of sharding, TomoChain’s transactions per second (TPS) will rise from 2000, up to a staggering 30,000 TPS. TomoChain has several stand-alone products to complement its blockchain. These include the TomoWallet, which is available on Android and iOS, the TomoScan blockchain explorer, and on-chain governance dApp TomoMaster; as well as a host of dApps in development. The TOMO coin will power transactions within these products. But the most highly anticipated product launch from the TomoChain team is TomoX, a decentralized exchange (DEX) protocol shipping in 2019. For DEXs who build on TomoChain, there’s no need to create tailored smart contracts for decentralized order-books, as instead, TomoChain masternodes will execute and match trades, and maintain order-books. The TOMO coin is the native cryptocurrency of TomoChain, with a fixed supply of 100 million coins, and a non-inflationary nature. TOMO is currently trading on Kucoin, Gate.io, Hotbit, and KKcoin. Underperforming masternodes, and their associated voters will lose income or face other penalties for inadequately maintaining the blockchain. The Tomo team explains that this makes the network stronger, by encouraging fair participants. TomoChain’s platform has attracted a wide range of dApp developers, especially in the gaming sector, who are building decentralized solutions on the network. TomoChain has also announced the launch of its first ICO. The Tomo team also discussed the exciting development of the first TomoChain ICO, Triip Protocol, a decentralized travel system. The integration of Triip will be announced later this year. Triip Protocol utilizes blockchain technology to offer customers quick, cost-saving, and sustainable traveling solutions. After winning several prestigious startup awards, Triip is now an official partner of TomoChain. Likewise, TomoChain has committed to growing the blockchain gaming industry, by announcing workshops, hackathons, contests and meetup events to help grow the developer community building on the TomoChain public chain. In addition, the Tomo team states that as the TomoChain code is open source and accessible via GitHub, developers can easily start building games on TomoChain. The Tomo team also added those game developers looking to raise funds for innovative new games could easily do so through an ICO on the TomoChain network. Going forward, TomoChain has a proactive approach to developing lasting partnerships and staying one step ahead of its competitors. We asked the Tomo team what the future holds for TomoChain, where they see partnerships forming, and how they will overcome competitive challenges in the future. With offices in Singapore, Tokyo (Japan), and Hanoi (Vietnam), three huge hubs of Asian tech activity, TomoChain are well placed to connect with key industry players. For game developers looking to stay up to date on development opportunities on the TomoChain network, they can follow TomoChain’s Telegram and Medium channels to stay updated. Finally, we asked the Tomo team how TomoChain would stay ahead of the competition, and pivot their business strategy to compete with other chains, such as Ethereum, Cardano, and Tron. In addition to its unique masternode technology which aims to solve scalability issues, the TomoChain will also have a strong ecosystem of dApps to grow the TOMO community. By focusing on quality dApps, TomoChain hopes that even if chains such as Ethereum do manage to scale, TomoChain will still offer a unique value proposition, separate and independently valuable from other chains. As TomoChain’s masternode solution is uniquely designed, the Tomo team believes that their solution will provide TomoChain with a competitive product advantage for a long time. TomoChain currently offers some of the lowest fees of any blockchain, with 1 TOMO capable of paying for 200,000 transactions, roughly 200 times cheaper than Ethereum. With its novel approach to sharing coming soon, TomoChain believes it can solve the scalability trilemma and build a buzzing ecosystem of gaming dApps and ongoing quality token sales. In conclusion, TomoChain is definitely a project full of promise, and Blokt looks forward to seeing what they build in the future. TomoChain, an Innovative Solution Aiming to Solve the Blockchain Trilemma was originally found on Cryptocurrency News | Blockchain News | Bitcoin News | blokt.com.